This consultation deals with proposed changes to the Treasure Act 1996 (‘the Act’), its associated Codes of Practice (‘the Codes’) and the process for finds that may be treasure following a review of the treasure process. The aim of the Act is to ensure that important archaeological items are preserved in public collections. We propose to improve the treasure process so that it is more efficient, that it is focused on the aim of preserving significant finds for public collections, and that it is more rational and easier to understand. We are also keen to ensure that there is a sustainable future for the treasure process. The aim of the consultation is to gather views on the proposed changes, and obtain information that will help us to assess the impact of these changes on groups and individuals. We also ask for opinions, suggestions and evidence which will support the development of future policies on the Act, the Codes and the treasure process. There are 32 questions that are raised. 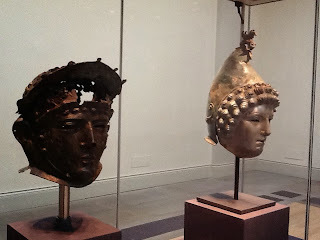 The so-called Crosby Garrett helmet is cited as an example of why the Treasure Act 1996 needs to be revised. Since the introduction of the Act, certain important finds such as the Crosby Garret helmet have not been acquired by a public institution but have been sold on the open market because they did not meet the definition of treasure. It is not clear why it had taken nearly nine years for DCMS to respond to these concerns. It is disappointing to see a public consultation citing a Wikipedia article as the source for the Crosby Garret helmet. (Would academics find this acceptable from their students?) My own views on the helmet can be found in 'Context matters: The So-called Crosby Garrett Helmet' [link].